Lords of Waterdeep is a classic worker placement game that takes place in the titular city of Waterdeep and features a full Dungeons & Dragons license. The game is now available in a range of digital formats (which we recently reviewed) and as such, we thought we’d dust off a copy of the original board game, as well as its only expansion (Scoundrels of Skullport) to give you the definitive insight into why Lords of Waterdeep is still considered one of the best worker placement games, even after the almost seven years which have passed since it launched. In Lords of Waterdeep, two to five (or six, with the Scoundrels expansion) players will each pick a set of coloured meeples (and a host of tokens) as well as an identity (which they will keep secret from everyone else) and then work towards becoming the most influential Lord in all of Waterdeep through the accumulation of victory points. In an unusual twist, the Lords themselves each represent the kind of people who do the hiring of adventurers in the classic Dungeons & Dragons games that we are used to, and so the completion of quests here is all about assembling the right team, rather than actually going out questing in your own right. Quest cards are the main (but by no means the only) way to score points in Lords of Waterdeep and players draw two randomly to begin with, as well as an intrigue card. New quests can be obtained from a shared market that shows four face up quests, but getting to them requires the player to use up one of their workers (and a turn) which can be quite costly given the number of other decisions to continuously balance. There are also buildings to construct, workers (clerics, fighters, rogues and wizards) to collect and intrigue cards to go after, the latter of which can convey rule-bending benefits, or ways to interact with opponents. After eight rounds of placing workers (in the long game variant) the players will reveal their secret identities and score them, as well as all of their completed quests. These, alongside any other bonus points, will be added to their existing score to determine the winner. More often than not, secret identities will offer additional points for completing quests of certain types, so there’s always an aspect of both hidden and open scoring just to spice things up a little bit. Lords of Waterdeep is often seen as a relatively straightforward worker placement game, but with a few variable features and the expansion content, it can still satisfy even the most experienced of gamer. As you would expect from a Wizards of the Coast product that is based on Dungeons & Dragons IP, Lords of Waterdeep is very nicely produced, as is the expansion, Scoundrels of Skullport. Both the game and the expansion come in larger-than-average sized boxes and each has a basic plastic organiser inside it which is a nice touch — arguably it is possible to squeeze the expansion content into the base game box (and in its organiser) but it does become a bit of a crush at that point. Removing the insert and using baggies is probably a bit easier, but personally I always end up keeping expansion boxes and any inserts complete. The actual components in Lords of Waterdeep rank somewhere between good and great. The wooden pieces include meeples and adventurer cubes, as well as a few ancillary components, but all of these are well cut and of uniform colour. Bearing in mind that each of the cubes is intended to replicate a different kind of character (cleric, fighter etc) it’s a shame that they are not cut to shape — using cubes does detract slightly from the thematic experience. That said, the production cost of doing so would likely have been prohibitive. Those who do buy the Scoundrels expansion will enjoy the blue skulls that represent corruption — they are very nicely cut and look fantastic when laid out on the dedicated corruption track. The board itself is of a fantastic quality and made to be perhaps overly large, which enables a fair bit of detail to be presented around the city of Waterdeep. Imagine a hand-drawn map effect and you’ll have the right idea for the backdrop, whilst the worker placement locations themselves are all picked out nice and clearly for ease of place. Buildings of different kinds are randomised during the game and placed when players build them, so the building times come in the form of cardboard squares that are also of a nice quality. A colour coded token for each player is slotted into a gap in one corner to show ownership and whilst this is a little fiddly, it’s a nicer touch that perhaps placing a coloured disk on them (or similar) as most games would. Other key features of Lords of Waterdeep include the quest cards, of which there are plenty in the base game and many more in the expansion, as well as intrigue cards for which the same applies. 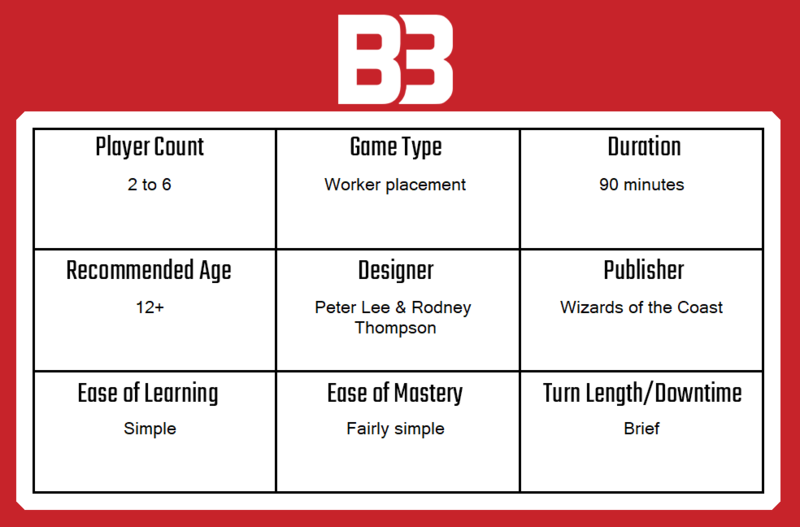 The base game alone has enough content to mean that it will rarely get boring, but with the expansion included it would be more or less impossible to see repetitive combinations of cards appearing over several games. If I have one complaint, it’s that the Lord cards don’t feature tons of variation (even in Scoundrels) but in fairness I think that’s to avoid imbalance in the game. Artwork on all cards is fantastic and those who enjoy the Dungeons & Dragons fiction will love it. As with most worker placement games, Lords of Waterdeep features a simple, turn based structure that places a focus on controlling the first player slot (to enable choice) and a dwindling selection of options as a round of turns passes by. At the beginning of the game, each player will begin with five meeples in their colour, with a fourth being added in the fifth round, which really compresses the board. Some features in the game allow the players to recruit additional meeples, depicted by neutral colours, which can be very powerful. When Scoundrels is added to the base game, it brings with it a couple of additional boards, each of which features a number of additional placement spaces that open things up considerably. Undermountain adds powerful benefits with no catches, but Skullport includes some even more powerful placement slots, with the downside of making any player using them take corruption. Each blue corruption skull will cost the player points at the end of the game, depending on how many have been collected amongst the players. Regardless of whether you play with the add-on content or not, the way turns actually work out in Lords of Waterdeep is much the same. The game is split into rounds and each round is split into turns. On a turn, the active player will place one meeple and take the action shown on the slot taken — this might be to take a quest, draw one or more adventurer cubes or something else like paying a fee and placing one of the building tiles. The key thing is that as the board fills up with workers, the choices available in a given round become fewer and fewer — in the end, it’s unlikely that the more powerful spaces will be available. Lords of Waterdeep, as I mentioned earlier, is often accused of lacking thematic depth thanks to the use of cubes as adventurers, and maybe because it does cast the players as Lords, who take a disassociated view of the quests that they complete. I don’t agree, though. It takes but the tiniest bit of imagination to bridge the gap between wooden tokens and wizards or rogues and all the while, the feeling of playing as an underworld kingpin or a benevolent observer pulling the strings on society is an intoxicating one. At around ninety minutes playtime and with lots of potential for variation, Lords of Waterdeep rarely outstayed its welcome. Each round begins with a smorgasbord of ideas that the player can consider — all of which will relate to working their way to the highest scoring quest either in their hand or on the board. Determining the order and importance of those actions is the whole game. Obtaining a quest card can be done in several ways, but taking two fighters and two rogues (plus one corruption) is unique and often highly prioritised. I’ve had turns in Lords of Waterdeep (sometimes final turns) where I chose boldly to skill up for a quest that I didn’t even have, then took it to claim the win. In other games, I was thwarted at the last moment. If I were looking for criticism, I’d probably say that I do strongly endorse playing Lords of Waterdeep with its expansion. Without it, the main board clutters quickly at four or five players to the extent that it’s unplayable, but at any count, it’s much less interesting. The base game provides at least one space for everything you’ll need — cubes of each colour, quest cards etc, but perhaps too often it really does provide just one way to obtain a certain resource, which pushes almost all of the interest to the buildings — thanks to their varied benefits. At least with the expansion boards in play, there are always at least three ways to obtain each resource, as well as a few interesting new features such as corruption etc. To conclude, Lords of Waterdeep deserves its position as a go to worker placement game that should occupy the shelves of gamers across a broad range of experience. Fans of Dungeons & Dragons should be particularly interested, thanks to the unique use of the world and artwork from the iconic series. Sadly there are no appearances from characters that span other material, but there are references to famous races, guilds, locations and such that most certainly pad the world out in a way that certainly interested me. One of the most appealing things about Lords of Waterdeep is how it can fulfill the (almost) entry level requirements that a true novice will require, whilst also delivering a strategically complex and rewarding experience for any player. There’s a real sense of excitement to be had in watching a masterfully planned series of quests come together. I also admire that there is little or no luck involved and that unusually for a worker placement game, there are ways to interact with the other players that feel balanced and thematic. Overall, Lords of Waterdeep is a game that I strongly admire and will continue to play for the foreseeable future. A copy of Lord of Waterdeep was provided for review purposes. You can find out more about it on the website of publisher Wizards of the Coast. Looking to get your friends or family into board games? Check out our list of great, accessible games, perfect for just that, here.